Aside from being the father to one of the best Nollywood actor, and being a veteran himself, not many can say too much about the private life of Adebayo Salami. 63 -year-old Oga Bello is one of the oldest actors in the Yoruba arm of Nollywood has been in the business for over five decades. He started movie production and acting side by side with legends! – When Oga Bello got his first movie role, he acted with legendary Ade Afolayan. Late Ade Afolayan is known to the older generation as Ade Love and to the younger generation as famous filmmaker, Kunle Afolayan and actor Gabriel Afolayan’s dad. Adebayo Salami did not disclose more than his union to 2 women throughout his career, so we are not certain if he has more or not. His union with his legally and Islamically married wives yielded exactly 18 children who we are proud to tell you are very successful today. 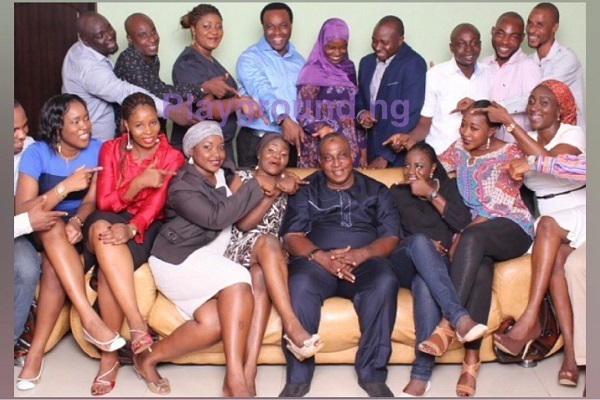 See a family picture of Oga Bello and his 18 children seated with him.